Horizontal or vertical, thick or thin, we do not discriminate stripes at any time throughout the year. So, if you’re like any of us, you consider stripes to be a pretty core part of your year-round wardrobe. This being said, go ahead and get your stripes on! Stripes are super flattering, trendy, and mostly considered a basic! We are seeing stripes in so many sizes and colorways in 2018, and we are all about it. We are here to tell you that if you wear your stripes strategically, you won’t be disappointed. Vertical stripes, such as pinstripes, create a slimming and lengthening affect. Vertically striped pants and dresses lengthen your legs and torso and make your façade more visually appealing. If you are trying to make your shoulders or hips look bigger and fuller, opt for horizontal stripes! These patterns will help you create a more proportionate look as well. From tops, pants, dresses, and even shoes, stripes are making their appearance known in today’s fashion world. So, why not add to your collection obsession? The best thing about stripes is that you can find something that fits for any occasion. They are a great print for all ages, too! For a casual vibe, pair a striped tank or cropped top with your favorite pair of boyfriend jeans or mini skirt. Or, if you’ve got a date night or party planned, whip out a chic striped jumpsuit or dress and everyone won’t be able to stop talking about your look! Everly Clothing is a brand that we have long carried at Gliks and it is a fan favorite for a reason! Everly embodies femininity, durability, and comfort in all their clothes. This brand was started by sisters Adriana and Fabiana in 2009. They both had a deep passion for creating a clothing line for the everyday women, and thus named their brand Everly. Together they share their love of fashion and use their unique differences to create a one of a kind brand. You can always find this season’s trendiest maxi dresses, two piece sets, and stripy rompers by Everly on Gliks.com. All of their designs showcase clean designs and fun patterns. Here are a few of the pieces that we carry to help you get an understanding of what this brand creates! From these 5 pieces you can get a real sense of what this brand designs. Every single article of clothing would be perfect for a picnic in your favorite park or to try out that new fancy restaurant for date night. Wherever your day takes you, Everly has the right outfit piece for the occasion! Be sure to head over to Glik’s soon to grab these pieces before they’re gone! From the runway to the streets, striped shirts have taken over. The beauty of this trend is that is not a passing fad that will become oversaturated or tacky in a few short months. On the contrary, fellow fashion lovers, stripes are here to stay. Stripes are such a simple pattern, but styling them can be tricky. The key to staying up on the trend is first choosing a versatile striped top. 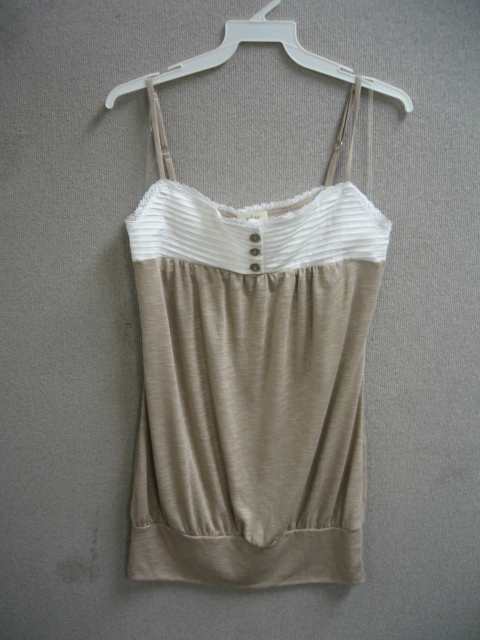 This basic Ginger G striped shirt features pencil stripes in taupe and white. Choosing a striped shirt with neutral colors will increase the number of different looks you’ll be able to throw together. For a classic look, striped tops can be paired with colored Flying Monkey skinny jeans, a denim vest, strappy sandals, and a statement necklace. A combination like this is easily achievable and it will leave you looking style savvy. Don’t be afraid to take a risk when styling your striped shirt. The white stripes in this top bring out the white within the pattern of these bottoms. Mixing patterns is totally allowed when done like this. Striped shirts can also look great with a textured skirt if you’re feeling up to the challenge. This look requires some risk, but what is fashion without a little risk? When pairing a striped shirt with a textured skirt, choose one in a solid color. This will help keep the patterned top in proportion to your textured bottom. For some added flair, don’t be afraid to choose a patterned shoe like these cheetah flats. When a trend proves to be as prominent as pencil stripes, it is crucial to find a variety of ways to incorporate them into your closet. Take a cue from the inspiration provided above, and have fun styling your own striped shirt! We have an assortment of striped dresses and striped shirts available on our website. We guarantee you’ll find a versatile piece you’ll love! Don’t know the port from the starboard? Good news! Here at Glik’s we can show you the ropes to the fun and preppy nautical trend. Favorited by many, these non-slip boating shoes were born in 1935 to Paul Sperry when he carved grooves in a gum rubber sole after watching his dog race effortlessly across the ice. His passion drove him to success and Sperry became famous to sailors, military and civilian alike. Fast-forwarding to present, Sperry Top-Sider has combined their technical attributes with a fashion forward mindset, creating casual and stylish footwear for everyone. We are excited to show you three of our new spring 2014 arrivals that just hit www.gliks.com. Stripes are an important key to styling out your nautical look. Whether you decide to embrace this trend in a big way, or choose to be subtle, this Made in the USA striped tank by Mind Code is perfect paired with these high-waisted white cut-off shorts. Don’t be afraid to accessorize with your favorite Pink Pewter headband and a pair of bottle-opener sunglasses. Completing this “fun in the sun” ensemble is a donut infinity scarf and our new Sperry Top-Sider Women’s Angelfish Boat Shoe in Navy/Serape. Perhaps one of the more understated nautical inspired fashions that we LOVE to see are mesh knits! These are fun to style with your favorite colored tank or cami, creating a different look each time. Red, white, and blue are fundamental colors found in nautical inspired fashions, so we paired this fun top with Americana shorts and sunnies. We add some more stripes to the look with our popular scrunched striped infinity scarf and Sperry’s Angelfish shoes in Red/Bretton. Don’t forget to add bracelets and other accessories to kick it up a notch! If you really want to unleash your preppy side, we recommend layering wovens under a knitted cardigan or sweater, which is perfect for the chilly breeze that can sail its way into your sun-filled day. This Roar button-down shirt is multi-functional, showing us that layering can be fun and quirky with this Volcom flamingo sweater. Prep it up some more by throwing on your favorite Flying Monkey Jeans and cuffing the bottoms to show off the stripes on your Sperry Top-Sider Angelfish boat shoes. Completing this outfit are anchor accessories and astute to boot glasses. So what if you can’t man the helm of a vessel (bully for you if you can), but with these inspirations from Sperry Top-Sider’s footwear, you can successfully channel your inner nautical fashionista. This is our last day of Be the Buyer 2! We are extending voting through the weekend and will be tallying up the votes on Monday morning, so make sure to get your “hot or not” vote in for all of our products. The items you like will go on the web store at www.gliks.com. This simple top looks great by itself or layered under a button down or a jacket. Every girl needs a white summer dress. Tank tops are always in. Dress this up with a blazer and dark jeans, or down with your fav pair of shorts and flip flops. This loose-fitting top is great for hot summer nights. White shorts and chunky jewelry top off the outfit. Neon, stripes, and a maxi dress, all great trends. This is a great dress to throw over your swimsuit and hit the beach.